It seems everyone is on a journey to find out where they belong. Whether they're taking that first step or have reached their destination, they just want to be accepted and appreciated. In other words, they want to find their tribe. I love that last definition. I've always belonged to a few tribes - each one addressing one aspect of my personality - and I thought myself content. 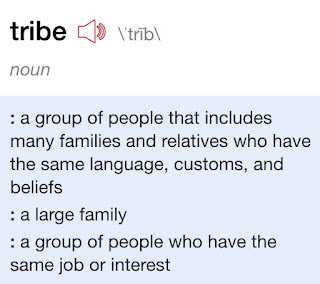 But it wasn't until recently that I found a tribe that speaks to me. Not just one part of me, but several of the crazy conglomeration of assorted parts that make up my entirety. Silly selfie. We do those a lot around here. It doesn't do to take oneself too seriously. I'm a unique character - a bundle of contradictions who can fit into a myriad of roles. I belong to many groups and can relate to most people. I'm well liked (I hope!) and often find myself able to converse freely with people of all sorts. Yet I have never felt understood. Not completely. I had all but given up on ever finding a true friend - one with whom I had a real connection. Fed up with the effort involved, I stopped caring what others thought and began being true to who I really am. I focused on improving myself and my talents - particularly writing. I began writing a book, spending two or three nights a week at a local restaurant pounding out words on my laptop. I was following my passion and was happy. Mostly. One day, after hearing about writers conferences from an acquaintance, I looked online to see if there were any nearby. Much to my surprise, there was. LDStorymakers Conference - a two-day affair - was to be a mere fifteen minutes from my house! The price was steeper than I expected, but my dear husband - who had watched me struggle with my insecurities for years - insisted I go. He even let me get a hotel room so I wouldn't have to drive home between sessions. Those two days were a whirlwind of classes, information, and - more importantly - a realization that I was not alone. There were others out there like me. Being my introverted self, I reached out to only a couple of people. Kind of like dipping my toe in the water to test the temperature. I didn't know what to expect. Would they accept me? Did I really find somewhere I could truly belong? Post-conference life got in the way of fully exploring the possibilities. Surgery, selling one house and building another, my kids' school, potty-training... I joined a couple of Facebook groups, followed a few people, created my identity as a writer. But not much more. Despite my lack of writerly action, I was determined to go the next conference. The glimmer of hope I had stashed so carefully away refused to be dimmed. I purchased my tickets to the following LDStorymakers Conference as soon as I could, despite the venue now being held an hour and a half from my home. Once again, my husband encouraged a hotel room (seriously love that guy!). And when the day finally arrived, I went. No expectations. I couldn't afford to be disappointed. It was one of the best experiences of my life. Surrounded by people who understood, who knew what I went through, who believed as I did. The hours flew by. My heart, mind, and soul were filled. And I made friends. I, who can be one of the most introverted and self-sustaining people on the planet, made friends. Fast forward a few months - I'm now part of a writers critique group. I follow and am followed by people who share my variety of strangeness on Facebook and Twitter. I'm making and reaching goals to chase my dreams. I feel loved, supported, and understood. I have finally found my tribe. I believed myself to be happy before, but now I know. My son with Richard Paul Evans - one of his favorite authors. My oldest son is also an odd duck. He obviously gets that from me. No real complaints since life is never boring. However, he's never been able to relate to kids his own age, and as a result, has always struggled to find and keep friends. Throughout it all, he has remained upbeat, loving, trusting, and completely himself. The loneliness and occasional social isolation wore on him, though, and he couldn't understand why kids couldn't relate to him. I often worried about him and desperately wanted to keep him home, safe from the cruel words and taunts he would receive. But he's an extrovert and needs to be around kids his own age. After a difficult decision to pull him from the online school that had been so beneficial for him academically, I enrolled him in the local junior high. First day of eighth grade doing online school. Notice the hot chocolate? That was a daily thing. As feared, the kids started up on him again. He never said anything, but I could tell it was wearing on him. There were many days I wanted to go mama bear on those who kept hurting my child, but he insisted he could handle it. Then, one day, he met someone. Someone as kooky and weird as he is. Someone who didn't quite fit in with the rest. Amazingly enough, this kid also lived just around the corner from the house we were building - close enough to walk. It seemed too good to be true. I doubted. I worried. I've never been happier to be proven wrong. The inkling of a potential friendship has grown into something more, something amazing. They became their own tribe. Tribes are funny things. They can number in the hundreds, like the LDS writers community I stumbled into. Or they can be just two people who have finally found someone who understands. 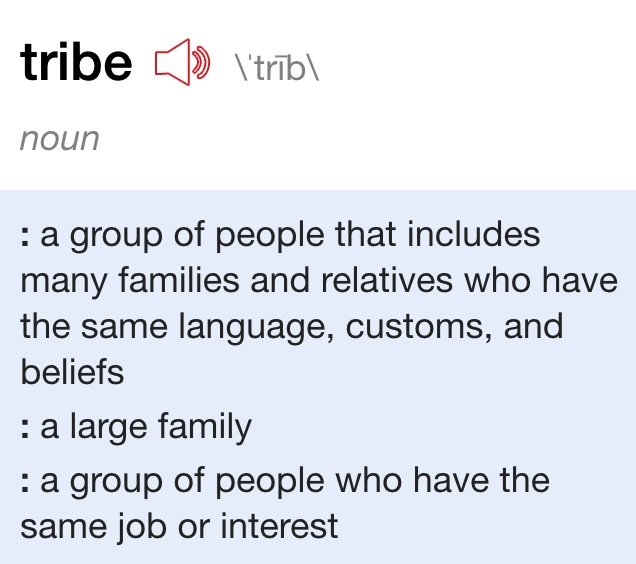 Tribes can be wonderfully diverse and general, like those who believe and worship together in the same church. If you can't tell by now, we went to the Salt Lake City Comic Con last year. No, size doesn't matter. The only thing that matters is knowing that someone out there loves (or even just likes) you for who you are. I was the Doctor, he was Mario. Yes. I do think I'm funny. So go. Follow your passions. Find others who share your loves, hopes, desires. Discover where you truly belong. Because if people as quirky and varietal as my son and myself can find our tribes, so can you.